The Kilimanjaro Marathon and Half Marathon is run at the foothills of the highest mountain in Africa, Mt Kilimanjaro, and the scenery is spectacular. Tanzania is a diverse country with its towering snow capped mountains, endless plains teeming with game and sun kissed tropical beaches. The altitude gain is manageable, with the entire race held between 830m and 1150m altitude on good, tarred roads. Combine this race with a Kilimanjaro climb, or a safari to the Serengeti, or perhaps relax for a few days on Zanzibar Island – the perfect destination to rest those weary legs. The race is run in the foothills of the highest mountain in Africa, Mt Kilimanjaro, and the scenery is spectacular. The Kilimanjaro Marathon route leaves Moshi stadium and heads down towards the town, and then along the main road to Dar es Salaam for approximately 8-9 km. This section of the route is relatively flat, and there are plenty of spectators and well-wishers along the road. You turn around and head back to the town of Moshi, turning toward the mountain and heading up a long, steady ascent towards Mweka. The uphill climb is gradual, but with Kilimanjaro towering above and all the local villagers out to cheer you on, the time passes quickly. The route then turns west through a lovely forest area before turning south for a fast downhill run back toward the stadium. Regular water tables as well as ‘sponging points’ and the odd ‘shower’ keep the runners refreshed and cool along the entire route. The route passes through many smallholding farms, villages, banana and coffee plantations and patches of forest, providing great excitement to the residents who give ample vocal support. For those running the Kilimanjaro Half Marathon, the route also starts at the Moshi stadium and after a short, flat section, it follows the gradual uphill route to Mweka as per the full marathon – before turning towards the stadium again. The atmosphere in the stadium is electric with local bands playing, entertainment, crowds of local enthusiasts to cheer the runners and lots of food and drink for sale. There is also a 5 km fun run. The Kilimanjaro Marathon and Half Marathon events starts and finishes at the Muccob Stadium in Moshi. The Fun Run starts at the bottom of Muccob Stadium, on Uru Road, and finishes inside the stadium. This may change, please check on registration. Minimum age for the Kilimanjaro Marathon is 20 years and 18 years for the Half Marathon. Baggage can be stored in the tent near the start line. Do not leave any valuables in your bag. There will be music at the finish, and sometimes live entertainment will be provided. A number of stalls and stands at the finish will sell food, drinks etc. You will need a Yellow Fever inoculation. This must be done no later than 10 days prior to departure. If you have had any previous history of liver disorders you must consult your physician first. Malaria prophylactics are a must. Please refer to your own doctor for advice. On arrival at Kilimanjaro International Airport you will be met and transferred to the Keys Uru Hotel in Moshi. Spend 3 nights here inclusive of breakfast daily. Collect your race number from registration at Keys Uru Hotel. Spend the day relaxing at the pool or you may choose to go into the town of Moshi, where you can buy curios and have some lunch at one of the local restaurants. Kilimanjaro Marathon – RACE DAY. Transfers to and from the stadium will be provided for all RunFun Travel clients. A private Hospitality tent with shade and drinks will be provided exclusively to all RunFun Travel clients at the finish. Return transfer to Kilimanjaro International Airport for your return flight. Additional travel packages and extension tours are available. Please contact us for details. The Keys Uru Hotel is a new and modern tourist and is located in an area where you can easily see the snow of Mount Kilimanjaro. Travel insurance – for your peace of mind RunFun Travel offers travel insurance to cater for all your travel plans. Contact us directly for a 20% discount on your travel insurance! Imagine finding yourself under the vast African sky in the middle of one of the last expanses of true wilderness left on our planet, listing to the haunting and mysterious sounds of night predators and their prey as the drama of their interactions unfold. 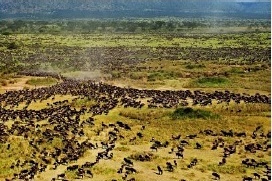 This safari will allow you ample time to visit the famous wildlife areas of Serengeti, Ngorongoro and Tarangire. 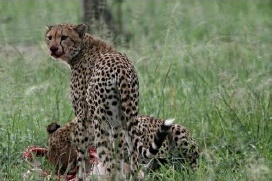 These parks are world famous icons and offer probably the best game viewing in Africa. The safari is run at a leisurely pace, ensuring plenty of time to explore the different regions - and particularly the Serenteti, where the three nights are spent at an intimate tented camp. On arrival at Kilimanjaro airport you will be met and transferred to Keys Uru Hotel for overnight before your climb. The Machame route is one of the most scenic routes up Mt Kilimanjaro by which to ascend. Nights are spent in high-quality 3-man alpine tents, sleeping a maximum of two persons per tent (so there is space for your luggage too). All your supplies and camping equipment are portered up for you (tents, 20-25 mm compressed foam sleeping mats, awnings, stools, lights, etc), and your meals are prepared. Your personal baggage limit is 12 kg for the climb. South African tents and sleeping mats are supplied on this trip. The guides are excellent (some have climbed Kilimanjaro over 400 times)! Each trip is led by a senior guide, with other guides in a ratio of approximately one guide per 2 or 3 climbers - if you are a bit slower than the rest or get ill and have to descend, a guide will always be with you. Food served on the mountain is generally plain and wholesome, including a lot of carbohydrates, stews and soups, vegetables and fresh fruit. Vegetarians are catered for, but please notify us in advance. We will send you the comprehensive Kilimanjaro Information Pack with booking which will include suggested gear, medical and training advice. After breakfast you will be transferred to the Machame Gate at Kilimanjaro National Park from where your hike starts. Today, walk through the beautiful rainforest with dense vegetation, often on a muddy trail, with short sections of steep climbs. The trekking pace is slow and very comfortable, ensuring you have enough time to enjoy the natural surroundings, take a photo and nibble on your packed lunch that we provide. The first campsite, Machame Camp, is on the edge of the dense rainforest, offering your first peek of the mountain in the distance. Tthe trail continues over steeper terrain interspersed with easy walking. The vegetation changes to increasingly sparse trees and bushes into moorland. There are generally plenty of Proteas and Erica flowers en-route as you gain height along the path. Views of Kibo and Uhuru peak with it’s snow-capped summit becomes a regular sight as you near Shira Camp. The camp itself is one of the most scenic as it allows views towards the west with Mt Meru in the distance and offer views of Kibo (the top of Mt Kilimanjaro). You often see the most spectacular sunsets from Shira with the clouds below you and the higher mountain peaks peeking through to catch the last bit of sunshine. Just a short hike from the camp is the Shira Caves. This makes a very nice acclimatisation walk before you enjoy a sumptuous dinner and settle down for the night. Today you hike up to 4,630 m (15,190 ft) while crossing a ridge and view the plains far below. Hiking through the alpine desert with boulders scattered around and dust hugging the rocks gives the illusion that you are walking on the moon. At Lava Tower, a big rocky outcrop, you have views of the ancient glacier ice of the Breach Wall on Kibo before descending to Barranco Camp. The path passes the "Garden of the Senecios", which features many of the huge senecio plants as well as lobelia plants. Sunset and sunrise at this camp is breath-taking. The sun paints the rocks in front of camp a dreamy red-yellow colour with the white ice of the high peaks shining bright. Looking towards the south you may see the little town of Moshi far below. You often sleep above the clouds at Barranco Camp. After breakfast you cross the Great Barranco Wall, topping out at about 4,420 m before dropping to the camp at the Karanga River at about 4040 m. The hike up the Barranco Wall is steep. You pass below the famous Breach Wall, the largest ice and rock face in Africa. The Breach Wall climbing route, known as ‘The Icicle’, was first climbed in the early 1970’s by Reinhold Messner. A field of sedimentary rocks litter the ground. You leave Karanga and hit the junction which connects with the Mweka Trail. Continue up to the Barafu Camp. At this point, you have completed the South Circuit, which offers views of the summit from many different angles. Amazing views of Kilimanjaro’s two peaks, Mawenzi and Kibo, are to be seen from Barafu Camp. An early dinner will be served in order for you to get the maximum rest before the final ascent starting at around midnight. Daytime temperatures can reach up to 26C, while evening temperatures often drop below freezing. Wake up very early to have a quick bite to eat and something warm to drink before setting out in darkness. The hike to Stella Point is a very slow steep walk on volcanic scree for about 5-6 hours. The headlamps on the trail towards the summit almost look like fireflies flying in a long row. As you approach the crater rim you will enjoy the most memorable sunrise you may ever experience – the sunrise over Africa! Often you see the curving of the earth at this high altitude and the sunrise on the horizon just accentuates it. Keep your camera ready at all times as there are plenty of photo opportunities along the summit. Once you reach Stella Point on top of the crater rim Uhuru Peak is in sight. Hike along fairly flat terrain for about 40-45 min to reach Uhuru Peak. Spend a few minutes at the top and get that photo of you next to the sign marking the summit - definitely one for your collection. Descend from Uhuru Peak in high spirits as you have just achieved your goal. The trail down from Stella Point on the Mweka route is often enjoyed by hikers sliding down the scree slope, which entails skidding down the loose gravel with big steps and some sideways moves. Try it, it is fun! With every step going down your body enjoys having more oxygen to breathe in. Depending on how you feel, you may enjoy a short rest at Barafu Camp before descending down to Millennium Camp or Mweka Camp. Most of the expeditions overnight at Mweka Camp this evening. Enjoy a slow hike through the rainforest to Mweka Gate. Take time to enjoy the lush vegetation with the Olds Man's Beard (tree moss) growing on the giant trees. The path has many steps leading you down to Mweka Gate from where you will be transferred back to Moshi to celebrate. This evening your guides will meet you to hand out your Kilimanjaro Certificates. Overnight at Keys Uru Hotel. Day at leisure to releax and regain some strength and energy b efore your marathon tomorrow. Overnight at Keys Uru Hotel. Day 9 - Sunday 3 March - RACE DAY! Transfers to and from the stadium are provided for all RunFun Travel clients. A hospitality tent, with shade and drinks, will also be provided exclusively to RunFun Travel clients at the finish. Overnight at the Keys Uru Hotel. After breakfast you will be transferred to Kilimanjaro International Airport for your return flight home. Day at leisure to regain the strength in your legs. Relax at the hotel or explore your surroundings. Overnight at Keys Mbokomu Hote. The Rongai route ascends up the northern side of Mt Kilimanjaro and down the south-eastern side. Nights are spent in high-quality 3-man alpine tents’ sleeping a maximum of two persons per tent (so there is space for your luggage too). All your supplies and camping equipment are portered up for you (tents, 20-25 mm compressed foam sleeping mats, awnings, stools, lights, etc), and your meals are prepared. Your personal baggage limit is 12 kg for the climb. South African tents and sleeping mats are supplied on this trip. The guides are excellent (some have climbed Kilimanjaro over 400 times)! Each trip is led by a senior guide, with other guides in a ratio of approximately one guide per 2 or 3 climbers - if you are a bit slower than the rest or get ill and have to descend, a guide will always be with you. Food served on the mountain is generally plain and wholesome, including a lot of carbohydrates, stews and soups, vegetables and fresh fruit. Vegetarians are catered for, but please notify us in advance. Wild Frontiers will send you the comprehensive Kilimanjaro Information Pack with booking which will include suggested gear, medical and training advice. After breakfast you will be transferred by road (approx. 3-4 hour ride) from the town of Moshi to the northern side of Mount Kilimanjaro. The day’s climb takes you from the village of Nale Moru up to Simba Camp. The climb will take about 2 - 3 hours. This part takes you through the cultivation area of the mountain, where you can see how local farmers tend to their lands on the slopes, and the rainforest. The trekking pace is slow and very comfortable, ensuring you have enough time to enjoy the natural surroundings, take a photo and nibble on your packed lunch that we provide. Overnight camping at Simba Camp. On day two you trek higher up on the northern slopes of Kilimanjaro leaving the montane forest behind. The path takes you into the Kikelewa Moorland area with fantastic mountain vegetaion such as Proteas, Impatiens and daisies. Enjoy great views of Kibo and the Eastern ice fields on the crater rim. Continue to Kikelewa Camp (10km/6.2ml; 6-7 hours) for overnight. Altitude gain: 720m/2,363ftA steep but short hike leads you over grassy terrain to the base of Mawenzi Peak. The views from here are spectacular into Kenya's plains below. The Vegetation diminishes as you gain altitude towards the towering spires of Mawenzi Peak. Spend the night at Mawenzi Tarn caop next to a lake. After breakfast you pass through the lunar desert of the Saddle. This is the lava covered expanse between the two peaks of Kibo and Mawenzi. Though the walk is not far, progress is slow due ot the altitude. Spend the night at the base of Kibo Crater at Kibo Camp. Settle in for an early night as your final ascent will start around midnight. The hike to Gillman's Point is a very slow, steep walk on volcanic scree for about 5-6hrs. As you approach the crater rim you will enjoy the most memorable sunrise you may ever experience - the sunrise over Africa. Often you see the curing of the earth at this high altitude and the sunrise on the horizon just accentuates it. once you reach Gillman's Point on top of the crater rim, hike along fairly flay terrain for about 1½hrs to reach Uhuru Peak. Spend a few minutes at the top and get that photo of you next to the sign marking the summit - definitely one for your collection. Descend from Uhuru Peak in high spirits as you have just achieved your goal. The trail down from Gillman's Point on the Marangu route is often enjoyed by hikers sliding down the scree slope, which entails skidding down the loose gravel with big steps and some sideways moves. Try it, it's fun! Enjoy a slow hike through the rainforest to Marangu Gate. Take time to enjoy the lush vegetation with the Old Man's Beard (tree moss) growing on the giant trees. You will be tansferred back to Moshi, Keys Hotel, to overnight and celebrate (breakfast included). This evening your guides will meet you to hand out your Kilimanjaro Certificates. Transfer from your hotel to Kilimanjaro airport for your departure flight. A minimum non-refundable deposit of $350 is required to secure your Kilimanjaro Marathon travel, entry and accommodation package. Should you choose a trek option, your deposit will be advised according to which package you choose. All prices are shown in AUD and subject to change at any time without notice.